Cambodia is not under any foreign laws; Cambodia is a sovereign, independent and strong member of the United Nations, Cambodian Prime Minister Hun Sen told Brad Adams, Executive Director of Human Rights Watch’s Asia on Thursday. His remark came after Brad Adams issued a statement accusing 12 Cambodian Armed Forces Leaders. 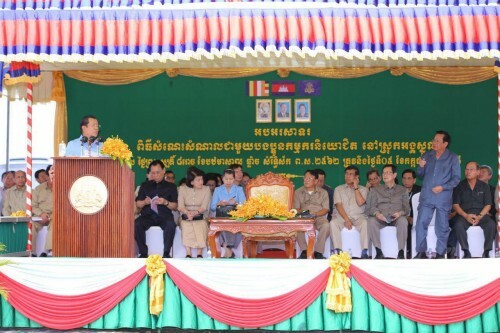 “I told Brad Adams again: national defense tools are the army and police […] never forget that Cambodia is not under your influence; you have no rights, this is a sovereign state,” Prime Minister Hun Sen said. The premier also warned to block Brad Adams from entering Cambodia. Reminding of suffering in the past, Prime Minister said that millions of Cambodians were killed, as foreigners considered themselves as the boss of Cambodia. He declared, from now on, not to let any foreigners be the boss of Cambodia. Khmer in this era will not sell or destroy the nation.